My travel tip for anyone visiting Bali is to keep your blinders on for a little while after exiting the plane. Leave the airport, get in a taxi and head north. Don’t stop until you reach Ubud and make that your home base. That was the choice I made and it resulted in experiencing exotic culture, supreme relaxation, and unique sights that I might not have had along the touristy beaches south of Denpasar. Kecak, Gamalan, Hindu temples, remote villages, monkey forests, bat caves, vacant beaches, sunken wrecks, water gardens, rice terraces, spa treatments, elephants, birds, reptiles, and more were all waiting for me. It seemed all I had to do was turn around and I was soon caught up in some new adventure. 01. 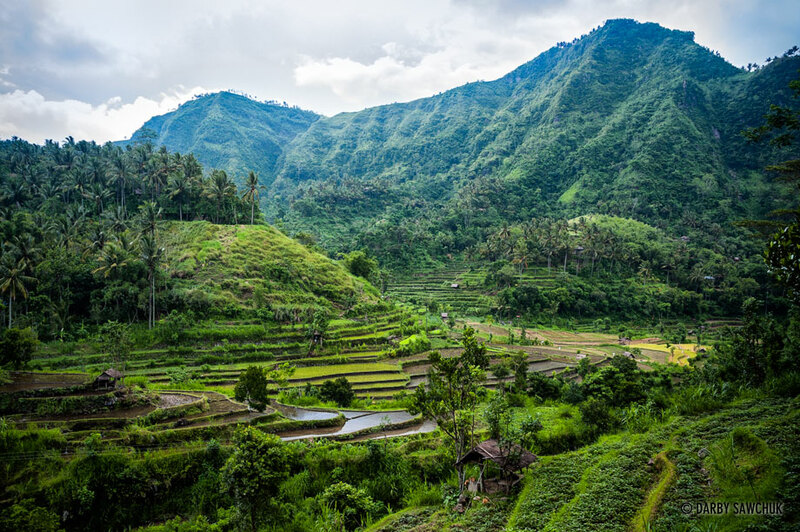 Terraced rice paddies and lush jungle cover the hills and mountains in the interior of Bali. 02. 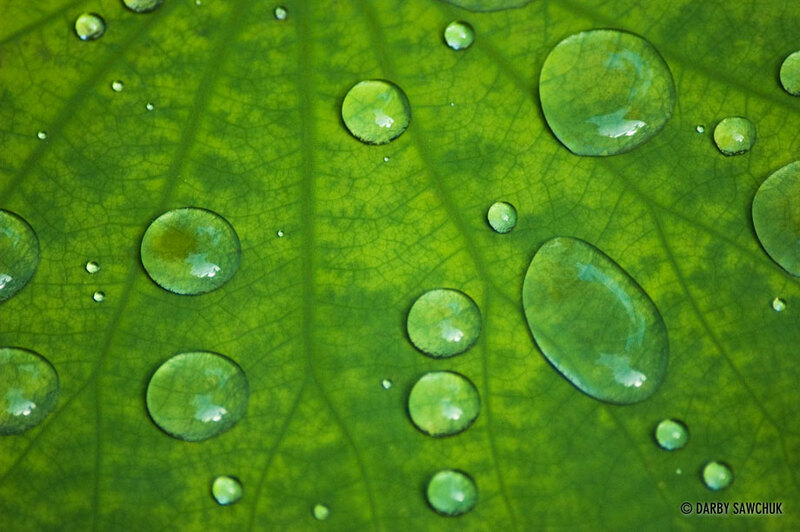 A close-up photo of water drops on a leaf in Bali. 03. 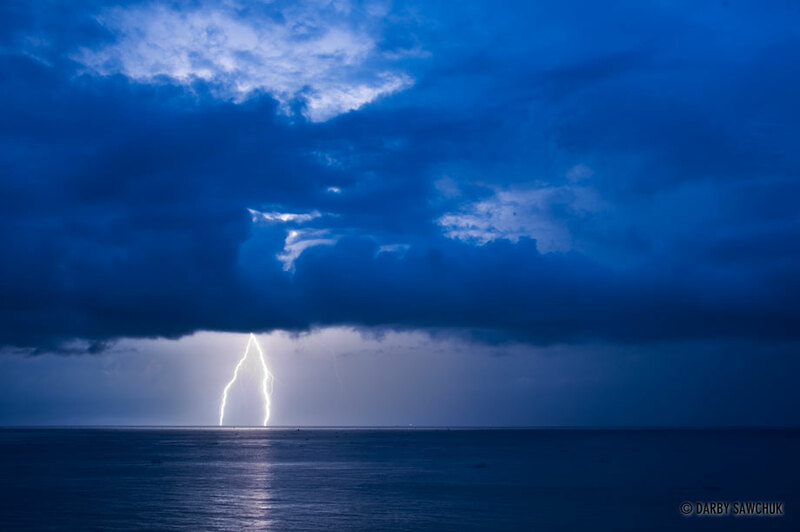 Lightning forks into the sea off the northern coast of Bali. 04. 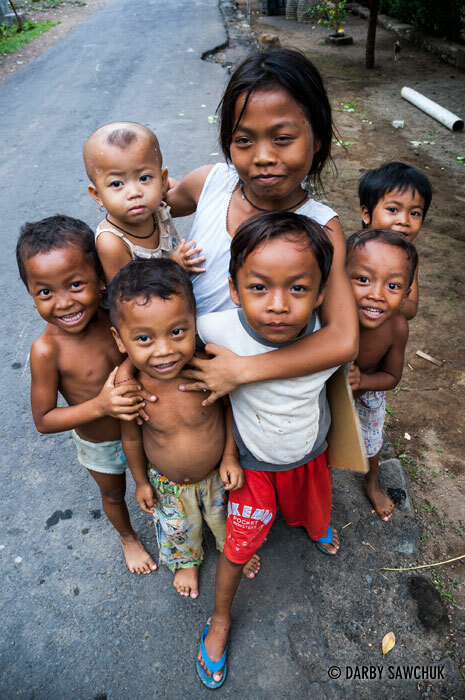 Young children smile in the small village of Amed on the northern coast of Bali. 05. Goa Lawah, a Hindu temple in Bali is famous for its bat cave inhabited by thousands of bats. 06. 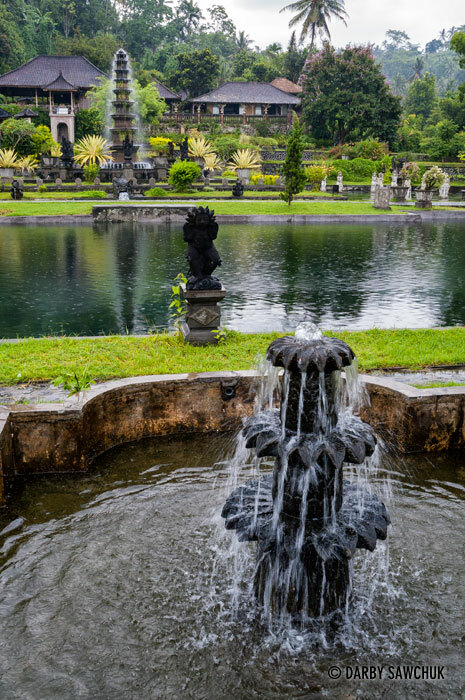 The water gardens of Tirtagamgga in eastern Bali. 07. 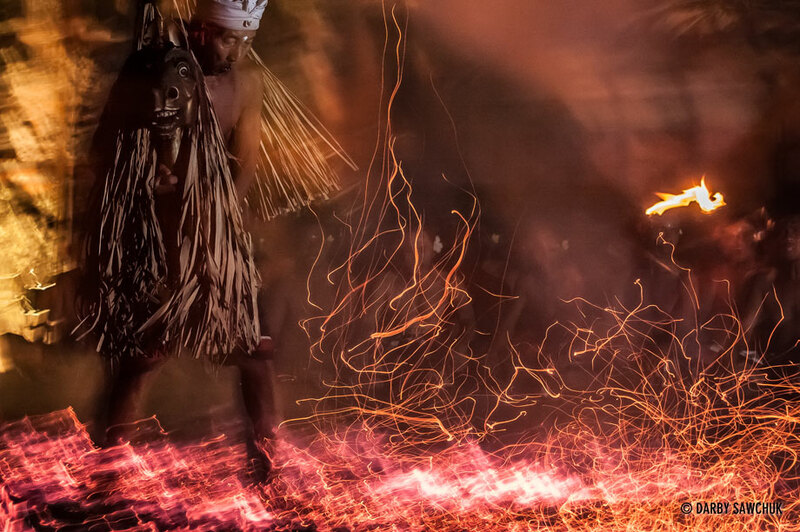 A man carries a wooden horse through burning embers as part of a Kecak dance in Bali. 08. 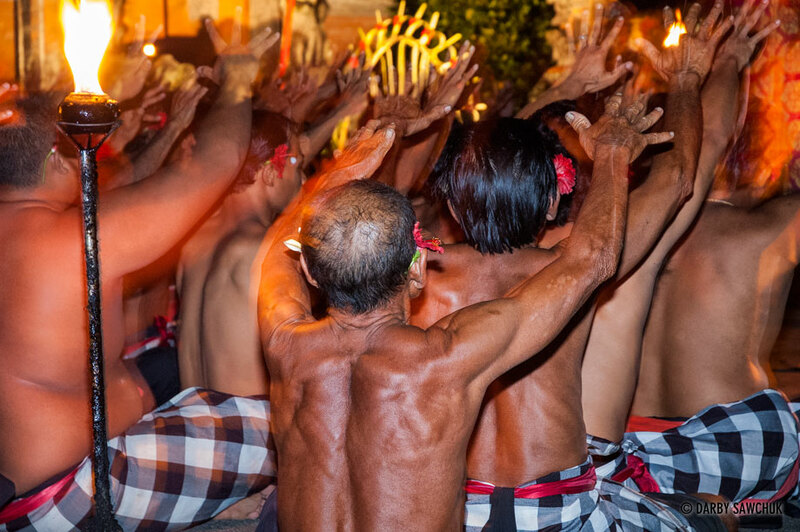 Kecak singers dance and chant in the Balinese musical drama. 09. 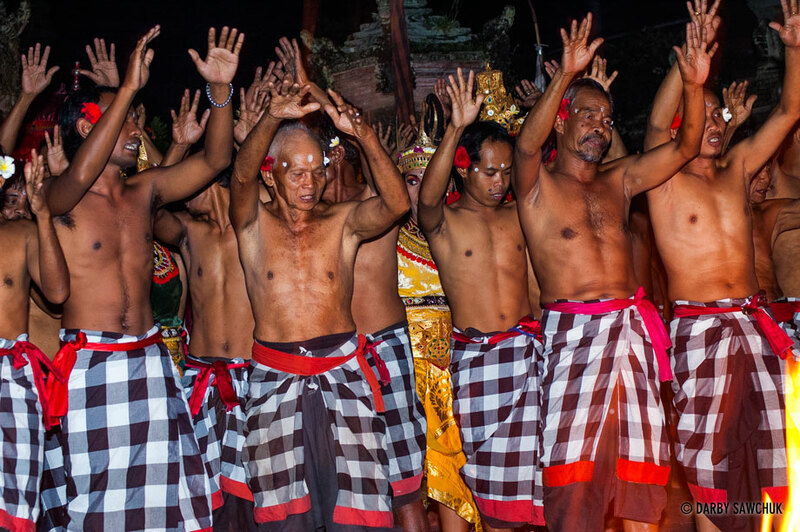 Kecak singers dance and chant in the Balinese musical drama. 10. 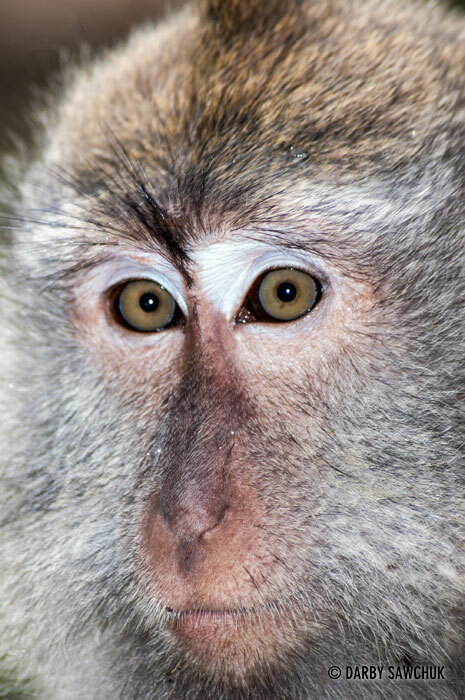 A close up photo of the face of a Balinese Macaque in the Sacred Monkey Forest Sanctuary in Ubud, Bali, Indonesia. 11. 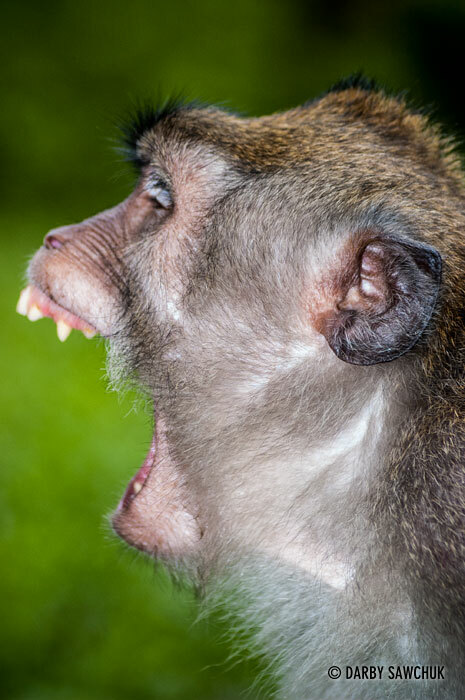 A Balinese Macaque in the Sacred Monkey Forest Sanctuary in Ubud, Bali, Indonesia. 12. 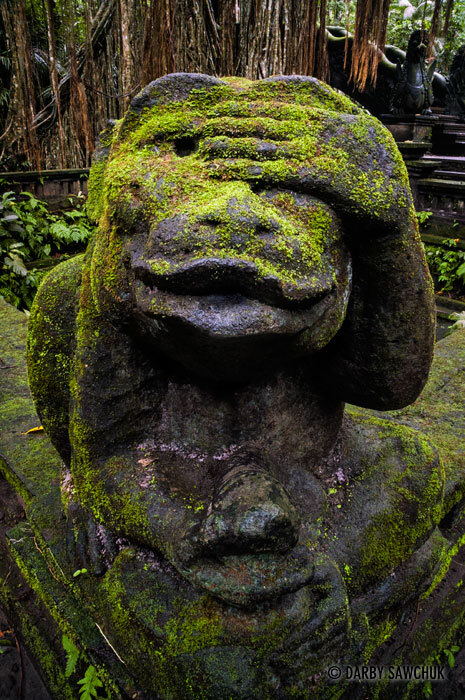 A monkey statue at the Sacred Monkey Forest Sanctuary in Ubud, Bali, Indonesia. 13. 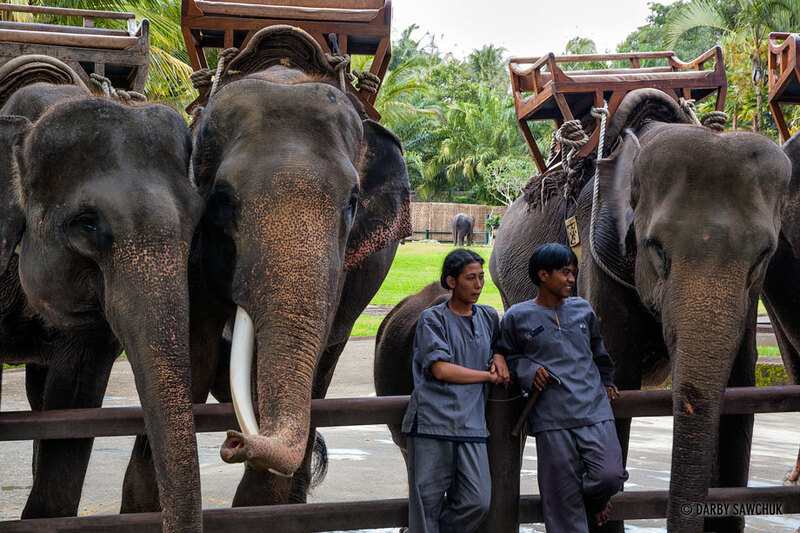 Mahouts rest with the elephants at the Bali Elephant Park. 14. 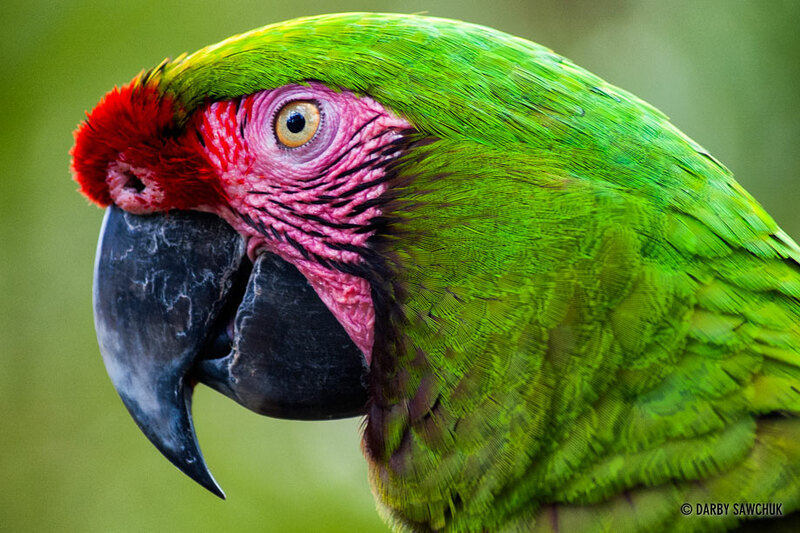 A parrot at the Bali Bird Park in Bali, Indonesia. 15. 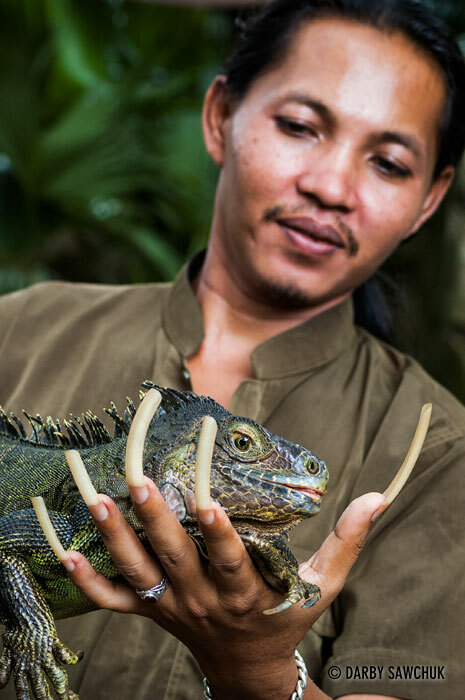 A reptile handler with long fingernails holds an iguana at the Bali Reptile Park. 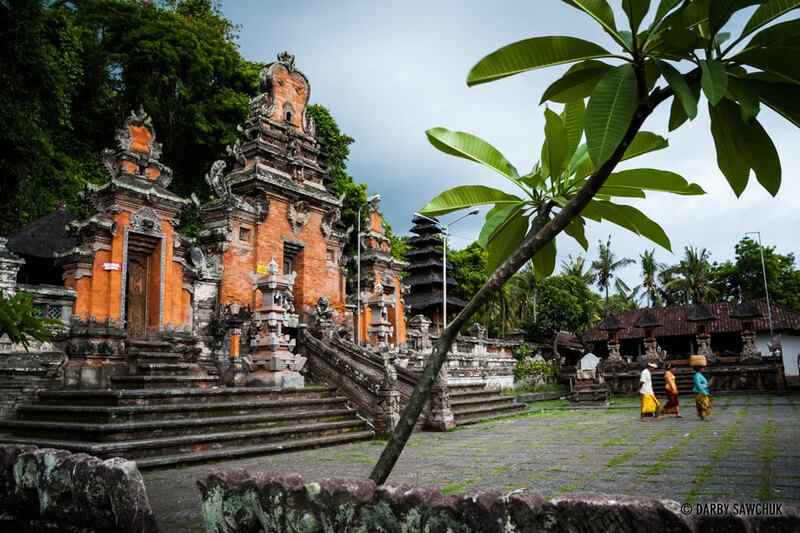 Keywords: photos of bali, indonesia, images of bali, pictures of bali, travel photography, fine art prints, stock photography, fine art prints.